The following Thanksgiving Proclamations demonstrate that while Christianity was not the official religion of the newly formed United States, it was the fundamental belief system of the majority of people. Even those who weren’t professing Christians understood that without God the foundation of government would rest on the whims and tyranny of either the few or the many. It is therefore recommended to the legislative or executive Powers of these UNITED STATES to set apart THURSDAY, the eighteenth Day of December next, for SOLEMN THANKSGIVING and PRAISE: That at one Time and with one Voice, the good People may express the grateful Feelings of their Hearts, and consecrate themselves to the Service of their Divine Benefactor; and that, together with their sincere Acknowledgments and Offerings, they may join the penitent Confession of their manifold Sins, whereby they had forfeited every Favor; and their humble and earnest Supplication that it may please GOD through the Merits of JESUS CHRIST, mercifully to forgive and blot them out of Remembrance; That it may please him graciously to afford his Blessing on the Governments of these States respectively, and prosper the public Council of the whole: To inspire our Commanders, both by Land and Sea, and all under them, with that Wisdom and Fortitude which may render them fit Instruments, under the Providence of Almighty GOD, to secure for these United States, the greatest of all human Blessings, INDEPENDENCE and PEACE: That it may please him, to prosper the Trade and Manufactures of the People, and the Labor of the Husbandman, that our Land may yield its Increase: To take Schools and Seminaries of Education, so necessary for cultivating the Principles of true Liberty, Virtue and Piety, under his nurturing Hand; and to prosper the Means of Religion, for the promotion and enlargement of that Kingdom, which consisteth “in Righteousness, Peace and Joy in the Holy Ghost” [Rom. 14:17]. And it is further recommended, That servile Labor, and such Recreation, as, though at other Times innocent, may be unbecoming the Purpose of this Appointment, be omitted on so solemn an Occasion. The following Thanksgiving declaration was drafted after the passage of the First Amendment. “The First Amendment, along with the rest of the Bill of Rights, was submitted to the states for ratification on September 25, 1789, and adopted on December 15, 1791.” that Leftists and atheists claim prohibits religion from influencing the political sphere of government. Why would the founders pass an amendment and then call on the President to thank God for excluding Him from the government they just established? 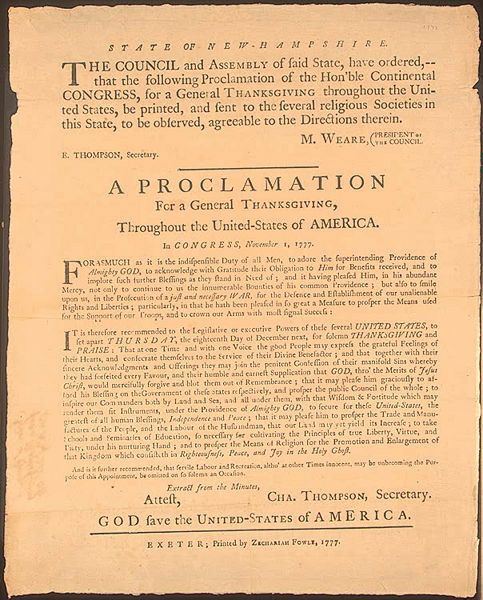 Whereas it is the duty of all Nations to acknowledge the providence of Almighty God, to obey his will, to be grateful for his benefits, and humbly to implore his protection and favor, and whereas both Houses of Congress have by their joint Committee requested me “to recommend to the People of the United States a day of public thanksgiving and prayer to be observed by acknowledging with grateful hearts the many signal favors of Almighty God especially by affording them an opportunity peaceably to establish a form of government for their safety and happiness. Now, therefore, I do recommend and assign Thursday the 26th day of November next to be devoted by the People of these States to the service of that great and glorious Being, who is the beneficent Author of all the good that was, that is, or that will be. That we may then all unite in rendering unto him our sincere and humble thanks, for his kind care and protection of the People of this Country previous to their becoming a Nation, for the signal and manifold mercies, and the favorable interpositions of his providence, which we experienced in the course and conclusion of the late war, for the great degree of tranquility, union, and plenty, which we have since enjoyed, for the peaceable and rational manner, in which we have been enabled to establish constitutions of government for our safety and happiness, and particularly the national One now lately instituted, for the civil and religious liberty with which we are blessed; and the means we have of acquiring and diffusing useful knowledge; and in general for all the great and various favors which he hath been pleased to confer upon us. And also that we may then unite in most humbly offering our prayers and supplications to the great Lord and Ruler of Nations and beseech him to pardon our national and other transgressions, to enable us all, whether in public or private stations, to perform our several and relative duties properly and punctually, to render our national government a blessing to all the people, by constantly being a Government of wise, just, and constitutional laws, discreetly and faithfully executed and obeyed, to protect and guide all Sovereigns and Nations (especially such as have shown kindness unto us) and to bless them with good government, peace, and concord. To promote the knowledge and practice of true religion and virtue, and the increase of science among them and Us, and generally to grant unto all Mankind such a degree of temporal prosperity as he alone knows to be best. Given under my hand at the City of New York the third day of October in the year of our Lord 1789. Notice that there is no contradiction between religion and science. Some of the greatest scientists in the world at that time and before were Christians.